The mayor of Portland has initiated a “safe sleep policy” to help the homeless at least sleep in safer areas of the city because these areas are well-lit and thus predators are less likely to rob or harm them when they are trying to sleep during the night. The news article also cites some statistics regarding the “state of homelessness” in the U.S. Portland, Los Angeles, San Francisco, and Seattle have declared a homeless emergency. These four cities estimate around 70,000 homeless in their areas. “The U.S. Housing and Urban Development Department says a third of American’s homeless are bedding down in California alone.” There is an estimated 600,000 population of homeless staying in shelters, transitional housing or “sleeping outside” around the U.S. This is NOT a tirade again Reagan or Republications or Democrats. It’s just trying to point out the facts about the above unfortunate political choices made by many in our Government regarding an issue. The second time I saw “homeless” Americans was while I was living in Lombard, a suburb of Illinois. It was around 1981, we were going through a BAD recession. One of the car dealers on Roosevelt Road went out of business and there was a sign posted at the vacant dealership property that said “May God Bless America.” I also saw a family of 3 or 4 people, this time at a busy intersection, holding a sign that said “homeless, need food.” During that same period of time, this time exiting a superhighway at another suburban area, it was a woman and her 12-year-old son. She held a sign saying ‘homeless.” Now in the year 2016, I take the bus to go to my dentist. I see homeless individuals holding signs and standing in the median strips of the roads. It scares me, I think “there but for the grace of God go I”. Now, of course, we’ve had the Great Recession or as I have called it from the beginning, The Great Depression Redux! We have heard about all of the homeless people living in the forest preserves. In Chicago we have many forest preserves, the preserves have become a refuge as well as green space for the citizens of the area. 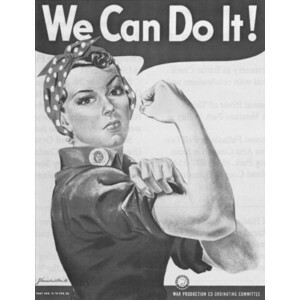 Rosie the Riveter during the war and the American family became a two-wage earner household after the war. 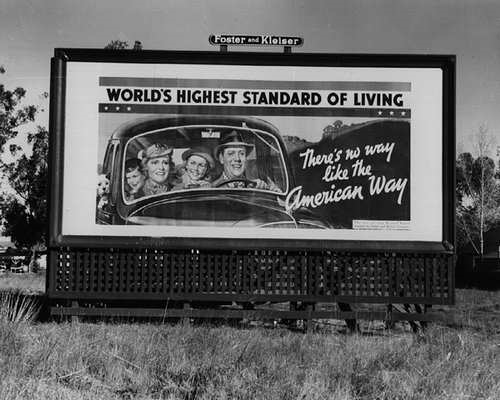 Automobiles gave Americans mobility. Paved super highways gave Americans the access to drive further away. That’s how the American “suburb” came into existence; along with the G.I. (Government Issue) home loan which allowed military veterans a way to purchase a home in the new suburbs. EUREKA! THE AMERICAN DREAM! *yes, at that time all eligible males over 18 years old were eligible for the military draft; we no longer have a military draft. Guess what! To me, America started to decline in the 70’s. I could perceive that something was wrong, but you just couldn’t put your finger on it. You just couldn’t put your finger on it. Our “homeless issue” is only one severe symptom of U.S. governmental policies gone wrong. To bring this posting to a close, just what can we do NOW! Well, it’s an election year. It’s a very pivotal election. Does it compare to, say, the presidential election of 1860 which Abraham Lincoln won or the 1932 election which Franklin Roosevelt won? One could say that every American Presidential election was a pivotal election. More than any other time in history, not only is there the possibility of every American citizen to be connected to each other via electronic means, but also to the world at-large. And, these connections are instantaneous, instantaneous! Thanks to the camera phone we can talk, text, photograph, and broadcast information as it happens. Thus, thought, action, and/or consequence, many times, are not given time to ponder before action or reaction takes place . Starting with the 2000 election between Gore and W. I’ve thought each election was the time we would turn the corner on the sourness that our culture carries with it. I don’t think the decline started in the 1970’s, I think it became apparent to the white middle class (I’m not race shaming you, but it is clear to me that white people — for very good reasons — are blind to the inequalities of our society). The race to the bottom was accelerated by trickle down economics and worsened when the generation raised in the 80’s came of age because they actually believed the rhetoric. I thought the Great Recession would be the bottom and the corner turned, but we continue to struggle mightily. Now we have a choice between a demagogue and a bureaucratic politician. It is one of the starkest choices we’ve had. Let’s hope this is finally the corner.